Crane equipment for petrochemical industry is employed in aggressive environment, which negatively influence the components and machinery. Explosive mixtures in close vicinity of which operate hoists, or explosive gases in the media of which may operate cranes, impose special requirements for the design of load-lifting equipment. GC "URALKRAN" is a manufacturer and supplier of equipment, software and components, meeting the demanding standards of GOST and SNiP adopted for petrochemical industry. Provision of flameproof and explosion-proof versions of load-lifting equipment. Design and manufacturing of coke bridge cranes with spans up to 46 m and an independent moving cabin, providing maximum visibility. The equipment is optimal for sites with a large area with dedicated stage for coke drying. Delivery of individual components and mechanisms, such as drums and cable sheaves, gears, bearings, load sensors, etc. Reliability analysis, testing, maintenance and repair of machinery without suspension of production. 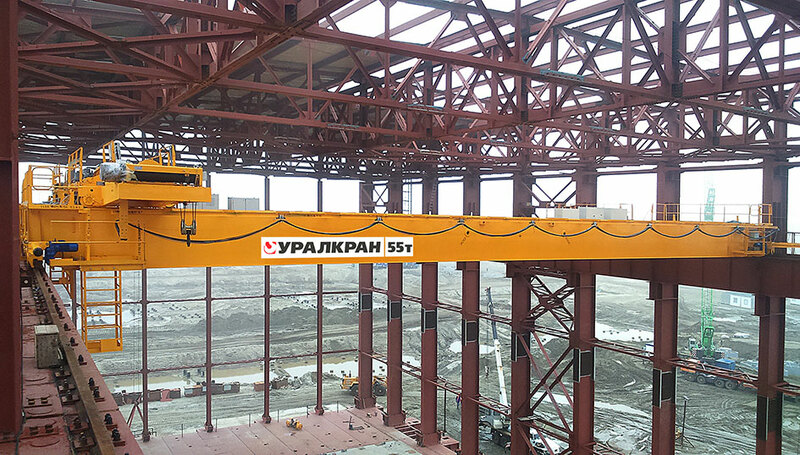 Upgrade of load-lifting equipment, implementation of intelligent management and control systems. Design of heavy duty cranes involves consideration of numerous components necessary for effective operation in a virtually continuous production and aggressive media. The majority of manufactured products are equipped with standardized mechanisms which reduce the number of unique parts and significantly reduce the cost and time of delivery/manufacture.